A live stats package for seeing who’s visiting your website in real-time has gone from being a luxury to a necessity for many in a short space of time. Knowing how many people are visiting your website can help you react to demand and instantly see if that fresh piece of content is a hit or not. While services like ChartBeat, Clicky, GoSquared and Google Analytics all offer the ability to track your traffic in real-time from your browser, we haven’t seen much of note in terms of mobile apps. 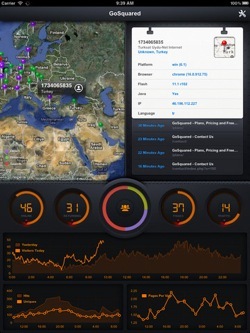 LiveStats for iPad changes that, offering a gorgeous and very useful way of monitoring site visits on the go. LiveStats works with GoSquared, so you’ll need an account for that service to get going. Once you’re set up, you can access a wealth of information via a deceptively simple interface. A row of dials across the screen shows vital stats like the current number of visitors, how many are returning visitors and the like. Graphs below that compare today’s performance with yesterday’s, while tapping the central button on the screen exposes more detail about exactly which pages are being accessed, and where from. Each visitor to your site shows up as a pin on a world map, and as you’d expect, you can pinch the screen to zoom in and explore them in more detail. 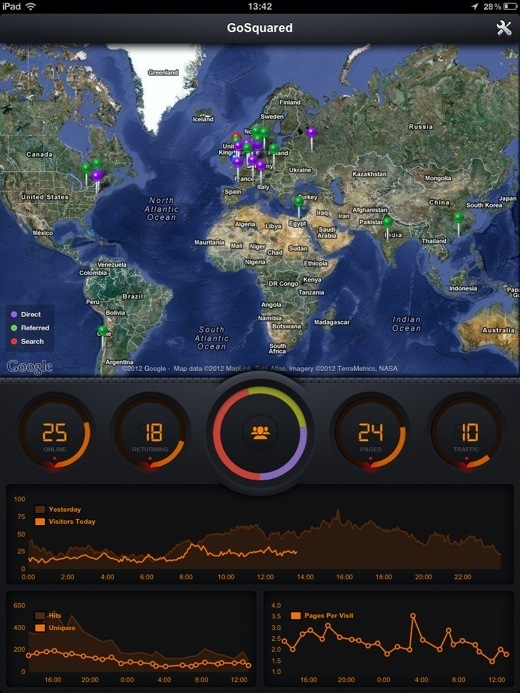 Tapping any pin shows that user’s IP address and information such as the OS, device and browser they’re using and more. The app also supports GoSquared’s ability to import user databases, so if you’ve done that and a user is logged into your site you’ll see them identified personally too. The stats aren’t restricted to your iPad either, as GoSquared CEO James Gill points out to us, by using Apple’s AirPlay feature, or using an HDMI cable, you can display the app on a TV. “It makes you feel like a Bond villain,” Gill says. 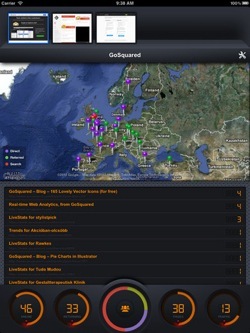 The app wasn’t developed in-house by London-based GoSquared, though. “Michael Hay at Korelogic was the guy who made it,” Gill says. “We met at a meet up in London a while back and he basically went away and hacked around with the GoSquared API.” Revenue from the app goes to Korelogic, rather than GoSquared. If you want to keep an eye on your site’s visitors in style from your iPad, LiveStats is a must-have. It costs $5.99 from the App Store.